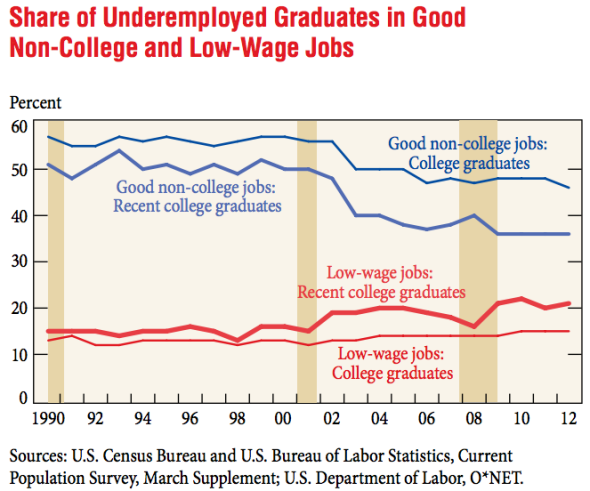 The problem for today’s underemployed college graduates is not so much that many of them are working in jobs that do not require a degree, but that their salaries in those types of jobs are lower than in previous years. But their jobs pay less than in the past. The bad news is that these recent B.A.s, working in jobs that don’t require a college degree, are in occupations that pay far less than in the past. It used to be that more than half of these overeducated young workers would find themselves in “good” jobs—meaning that they’d pay at least $45,000 in today’s market. Today, less than 40 percent do. Meanwhile, more than a fifth of this group were in low-wage jobs, meaning they paid $25,000 a year or less. … Good non-college jobs consist of those occupations—for example, electrician, dental hygienist, or mechanic—that paid an average wage of around $45,000 per year in 2012. While these jobs do not require a bachelor’s degree, they tend to be career oriented, relatively skilled, and fairly well compensated. At the other end of the spectrum, low-wage jobs paid an average wage below $25,000 per year in 2012, and include occupations such as bartender, food server, and cashier. Add in the problems of recent college graduates suffering the worst unemployment rates in 50years and the unprecedented student loan debt levels, the picture looks gloomy for this year’s crop of graduating seniors. Jaison R. Abel, Richard Deitz, and Yaqin Su, “Are Recent College Graduates Finding Good Jobs?”, Federal Reserve Bank of New York Current Issues in Economics and Finance, Volume 20, Number 1, 2014. 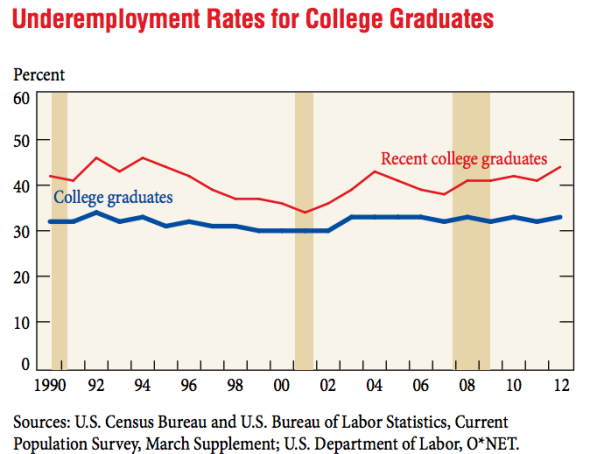 Jordan Weissmann, “How Bad Is the Job Market for the College Class of 2014?”, Slate, May 8, 2014.